← Life is Tough, and It’s Tougher When You’re Stupid! That really should read “I 286 the Windows; I 386 the Windows; I 3.11 the Windows…” I’ve been using Microsoft Windows™ since it was a DOS overlay back in the early eighties, starting with Windows 286, through Windows 386, Windows 3.0, Windows 3.11, Windows 95, Windows 98, Windows ME, Windows NT, Windows 2000, Windows Server 2003, Windows XP, Windows Vista, Windows Server 2008, and Windows 7. I’ve used them all. And now we get to “I EIGHT the Windows!” Windows 8 has arrived on store shelves and at the TreeHouse. When MicroCenter (our local MicroCenter is on Memorial Drive in Cambridge MA) offered the upgrade version of Windows 8 Pro for $38.88 in a hybrid on-line/in-store promotion last week; I lunged. I pre-ordered it online on the 24th, but had to pick it up in-store. That I did Saturday the 27th (part of my pre-hurricane errands!). 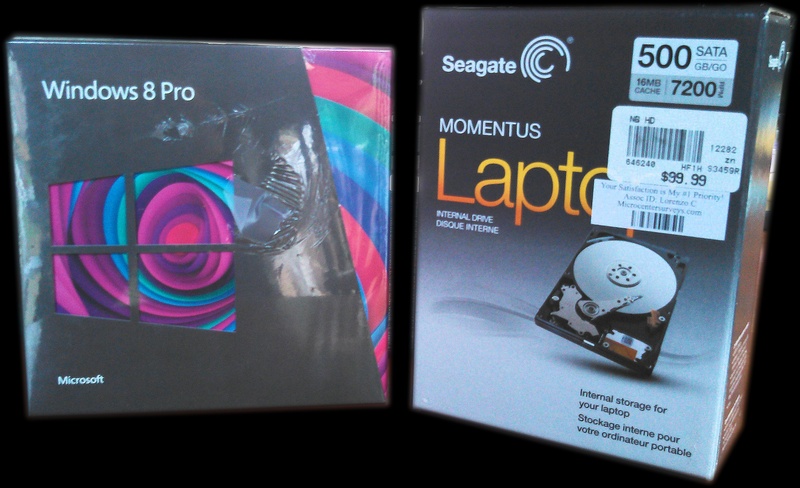 I also bought a new hard drive for the laptop I planned on installing Windows 8 on (for $25 off the sticker price). I’ve found over the years when upgrading to a major new version of an operating system that buying a new boot drive and installing a clean copy onto a clean hard drive is the least painful, rather than trying to upgrade an existing install which may be 3 or 4 years old. Three or four years of heavy use takes its toll on an instance of an operating system; applications being installed and maybe uninstalled, old hardware and accessories being replaced with new ones, etc. ; all take their toll on the speed and efficiency of an installed operating system. For Windows, the victim is often the registry; The Windows Registry is an internal hierarchical database that stores configuration settings and options for the operating system, peripherals, applications, and other various and sundry things. The bigger it is, the slower it performs and the more likely something will get corrupted. After 3-4 years of active use it can get HUGE! So I prefer to start from scratch. That way, I also have to think long and hard about the applications I want to re-install, so that helps clean house in its own way. My purchase and use of hard drives extends back to the early eighties when I bought a new-fangled BOOTABLE 10-MEGAbyte hard drive for my original IBM PC Model 1 from a company down in Lake Mary Florida called Maynard Electronics. It only cost me $1,100! That’s $110 per megabyte! My 10 megabyte hard drive could hold the equivalent of over twenty-seven 360kb 5-1/4 inch double-density floppies!! Suffice it to say that I’m still in awe of what I can buy for hard drives these days (my purchase for the Windows 8 installation was of a 500 GIGAbyte 7200 RPM 2.5 inch SATA drive, for $75 – ). Windows 8 wasn’t a total shock to me; I had downloaded the Windows 8 “Preview” version back in August to take it for a test-drive and see what the hoopla was all about. The version I bought last week was supposedly an UPGRADE version, which means I had to have a legal previous copy of Windows on the hard drive first, but nowhere on the package – inside or out – could I find any indication that it was an UPGRADE copy instead of a FULL INSTALL copy, so I decided to give it a shot with a direct install to a clean disk. If it didn’t work, I could always reformat and install a copy of Windows 7 first and then do an upgrade install. All that would be lost would be a couple of hours of my time. Armed with a small-sized Phillips-head screwdriver (two chassis screws and a face-plate screw), I had the older drive out and the newer drive installed in the 3+ year-old Dell Latitude E6400 in less than five minutes. I popped the 64-bit Windows 8 DVD in the optical drive and booted up. Nothing to boot from on the hard drive (being shiny-new and totally empty), so it booted from the optical drive directly. Up comes the install program and away it goes. With only a few user input pauses (one for the software key, of course) it took about 45 minutes to finish installation. Once the machine rebooted it loaded Windows 8 for the first time from the new hard drive – it looks like it worked! I went through the 15-20 minute first-boot setup (user name, establish an online user-account so I can load free apps and buy priced apps from the Windows App Store, etc.) and started using Windows 8! I was using the laptop “unaccessorized,” i.e., no peripherals like a monitor or keyboard or mouse plugged in, so the internal touch-pad was my mouse. But the touch-pad performance was horrible. It was like using a mouse in molasses! It took me 4-5 repetitive swipes to move the pointer from one side of the screen to another! I remembered from initially installing Windows 7 on this laptop that the Alps Touch-pad driver was needed from Dell for the full features of the touch-pad to be unlocked. I had bought this laptop six months ago at one of my company’s tri-annual employee auctions. My company life-cycle-replaces employees’ laptops every three years, and auctions off the old ones to employees for a fraction of what they paid for them. True, they’re 3 or more years old, but I got an industrial-strength ruggedized laptop with all the hardware bells and whistles for pennies on the dollar. The only down-side is that they come with no software; no OS, no apps, no drivers. So I had to buy an operating system for it (I chose Windows 7 at the time) and I had to download all the drivers for the E6400 from Dell. That was when I first encountered the molasses-impaired touch-pad experience, which was solved by the proper application of the correct driver. It turns out that the Windows 8 install program did not recognize the touch-pad as a touch-pad, and installed the “generic PS/2 mouse” driver for it instead. Once I installed the Windows 7 touch-pad driver, it kicked into fifth gear and performed like I was used to. Phew! So here was Windows 8 in all its glory; fully functional and ready to get to work! The default START screen looks like a surreal board game of some sort, with Chiclet squares all over the display. Each Chiclet is an icon for an “app,” which are pre-installed (or purchased and/or downloaded from the Windows Store) little mini applications somewhat similar to the pre-installed programs that came with previous versions of Windows. It’s at this point that you start to realize that Windows 8 was not designed to reside only on traditional desktop and laptop computers. Those of us with smartphones or tablets will recognize the visual layout. Windows 8 is meant to be a touch-based user-interface to a computer, not a mouse-and-keyboard-based user-interface. Those Chiclets are meant to be tapped with a finger, not clicked with a mouse. Holy Android, Batman! Thankfully for those of us with mere keyboard-mouse computers, there is a familiar DESKTOP interface available, but it’s not the default interface. You have to click a Chiclet to get to it, and once you do, the universe comes back into focus and all is (mostly) right with the world. The surreal alternate Chiclet universe is put aside (though not permanently) and things suddenly work the way you expect them to; UP is up, DOWN is down, and the Law of Windows Gravity is reinstated. I’m told that laptops with touch-screens are available now, and touch-screens for desktops are on their way, so those of us with antiquated hardware will be able to kluge together a make-shift environment for Microsoft’s alternate universe. In the meantime, get used to bi-polar computing. I spent a few hours exploring, looking for all the familiar tools and techniques. Some were right where I expected them to be; some were nowhere to be found. I use Notepad a lot; it’s a great little place to jot stuff down or to copy text and strip out any formatting, etc. I couldn’t find it. I finally went into the hard drive using the renamed File Explorer (formerly known as Windows Explorer) and found NOTEPAD.EXE in the SYSTEM32 directory under the WINDOWS directory. I created a shortcut for it on the desktop. One of the features of Windows 8 (and similar to Windows 7) is that you can have an image associated with your account on the Windows 8 machine. The default image is a stylized Weeble silhouette (“Weebles wobble but they don’t fall down!™”). I decided I didn’t want the Weeble image so I went hunting for where it could be changed. Easy enough to find (right-click on the Weeble image), but it wouldn’t let me set it to an image of my choice. Evidently my copy of Windows 8 hadn’t been “activated” yet. Okay, I found an “activate now” button and pressed it, and it prompted me for my software license key (didn’t I enter that when I installed Windows 8?). Alright, I dug out the card with the key and entered it again, and it rejected it, telling me it was an invalid key. Excuse me? I carefully read the key off the card and carefully typed it in again. Same thing; invalid key. WTF??? A third, VERY meticulous entry resulted in the same thing, so I pulled the accompanying error code and did some googling (or was it binging?). What I discovered was that I had been bit by the risk I took at the very beginning, it just wasn’t immediately obvious. According to my search results, installing an UPGRADE copy of Windows 8 without having an underlying legal copy of a previous version of Windows installed on the hard drive results in a copy of Windows 8 that CANNOT be activated. So it’s a 30-day trial copy, doomed to lock itself up in a month. GOTCHA! So I reformatted the hard disk, installed a licensed copy of Windows 7 on the hard drive, and then installed Windows 8 over that. All became well. My copy was activated, I could change my account icon (no more Weeble portrait), I could download apps from the Windows Store (free and paid-for). My learning experience wasted a couple of hours of install-time. Live and learn. I’ve been using Windows 8 on my laptop for almost a week now. It’s fine. It’s different, but it’s fine. I’m reminded of the time we hired some cleaners to clean our house before Thanksgiving because we were hosting the holiday dinner and neither of us had time to do the house-cleaning properly. For weeks afterward we couldn’t find some things. Lots of things were where we expected them, but some things weren’t. Nothing was stolen, but the things were placed where someone else’s logic had decided they should be. Windows 8 is a lot like that… “Where’s the Control Panel?? Where’s CheckDisk?? Where’s Notepad?? How do I shut down a Chiclet App instead of just hiding it? ?” I’m finding these things, but sometimes not where I expected to find them! My biggest hope is that I can find a way to have it boot up in Desktop mode rather than Chiclet mode. That and finding either a functional replacement for Briefcases or a way to activate them in Windows 8 would be nice. I do like the boot and shutdown speed (FAST! ), and the Chiclet SOLITAIRE game is so much better than the one that’s come with Windows since the 80s! !